No. 17 Michigan State shows grit in home win over No. 9 Maryland. EAST LANSING, Mich. (AP) — The first season Maryland joined the Big Ten, the Terrapins went unbeaten in conference play — both the regular season and the league tournament. Jenna Allen scored 16 points and Nia Clouden added 15 to lift No. 17 Michigan State to a 77-60 victory over No. 9 Maryland on Thursday night. It was only the 10th loss to a conference opponent for the Terrapins since 2014-15, but seven of those have occurred in the last 12 ½ months. Maryland figures to drop, but Michigan State is not making it easy on voters with its enigmatic play of late. The Spartans lost at Ohio State on Monday, which likely limits how far they’ll rise in the ranking. 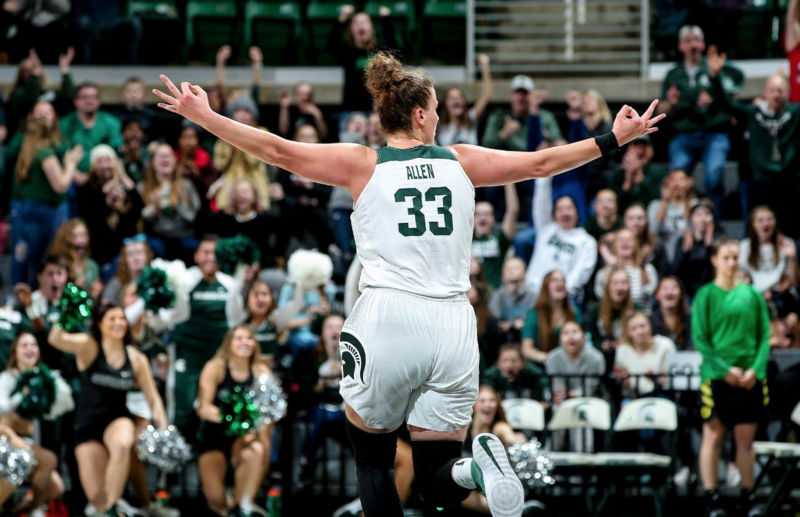 Tori Jankoska, Michigan State’s career leader in scoring, is now on the Maryland staff as director of recruiting operations and player personnel. “Having Tori sitting over there on the sideline made me want to beat them more, to be honest,” Spartans coach Suzy Merchant said with a laugh.